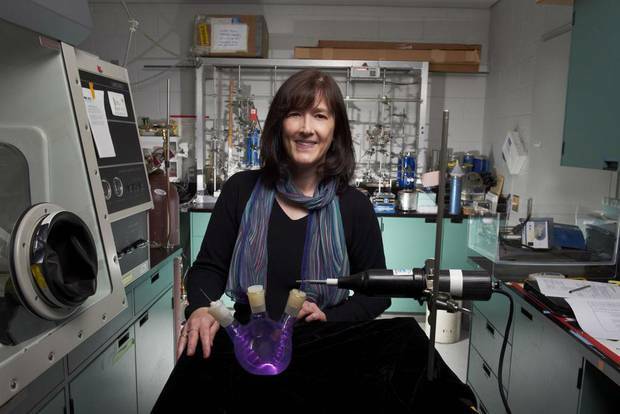 Barbara Sherwood Lollar named to the Order of Canada for her contributions to geochemistry, notably in the development of innovative mechanisms for groundwater remediation, and for her discovery of ancient fluids that hold implications for life on other planets. When Barbara Sherwood Lollar was growing up in Kingston, summer vacation meant travelling across the Atlantic as the child of two historians, both professors at Queen's University, as they pursued their research in the libraries of Europe. Her summer reading consisted of books her parents brought along to keep their three children occupied along the way. It was likely during one of those family trips that Dr. Sherwood Lollar says she first cracked open Jules Verne's classic tale of subterranean adventure and discovery, Journey to the Centre of the Earth. The idea that unseen worlds lie hidden beneath our feet caught hold of her imagination then and never went away. Science is about sober, reasoned analysis, hard work and incremental progress, she says. "But the exploration side of it – the side that grabbed me in the first place – is still at the heart of so much of what scientists do." It was the quest to explore that ultimately led Dr. Sherwood Lollar, an internationally known geochemist at the University of Toronto, to become an expert at measuring the trace isotopes that are carried by water moving deep below ground. In some cases, those isotopes have allowed her to track the history and movement of environmental contaminants. More famously, they helped her prove that water seeping into a Northern Ontario mine, three kilometres deep, has been cut off from the surface for more than a billion years. The find raises the tantalizing possibility of ancient microbes surviving in isolated reservoirs within the Earth, and on Mars too. Dr. Sherwood Lollar hopes this latest recognition of her work will enable her to do more to promote diversity – including gender diversity – in Canadian research. "We each have a tendency to self-replicate," she says. "We need to step back and think of excellence in a way that's different from our own archetypes." James W. St. G. Walker, Waterloo, Ont. As one of Canada's leading voices on the history of racial justice, James Walker, 75, has spent much of his career studying the profound impact of black Canadians on the country's foundation. A professor of history at the University of Waterloo, he has published numerous articles and book chapters on the subject, notably "Race," Rights and the Law in the Supreme Court of Canada. Inspired by the 1965 marches in Selma, Ala., Prof. Walker was one of the co-founders of Dalhousie University's Transition Year Program, meant to confront Canada's own inequalities. "Some of our kids hadn't even finished public school.… We thought that a year of education would enable young black kids to go back into their own community and become leaders," he said. Almost 40 years later, the program has led to greater enrolment for black and aboriginal students at the university. But he feels there is still more work to be done. In particular, his book A History of Blacks in Canada: A Study Guide for Teachers and Students has yet to stir up the interest he hoped. For Prof. Walker, reading isn't enough. "There's a political awareness that has to be injected somewhere. If people read it and it's just a nice story, they move on." When federal and provincial housing ministers gathered this week in Victoria to discuss a national housing strategy, Jean Swanson was among protesters who dogged their footsteps, asking what the bureaucrats planned to do for the people living in a tent city nearby. For the last four decades or so, that's where Ms. Swanson, 73, has been: marching and organizing on behalf of people who are poor and vulnerable. Asked to cite achievements, she instead says things have gotten worse: Vancouver recently posted its highest homeless count in a decade and welfare rates in British Columbia have not been raised for nearly as long. So she keeps up the demands: for higher welfare rates, more social housing and an end to austerity. "Governments could change that, they've done it in the past, they need to get their act together and do it again," she said. Abraham Anghik Ruben, Salt Spring Island, B.C. Abraham Anghik Ruben is named to the Order of Canada for his artistic contributions as a sculptor and for his preservation of our northern heritage and national identity. 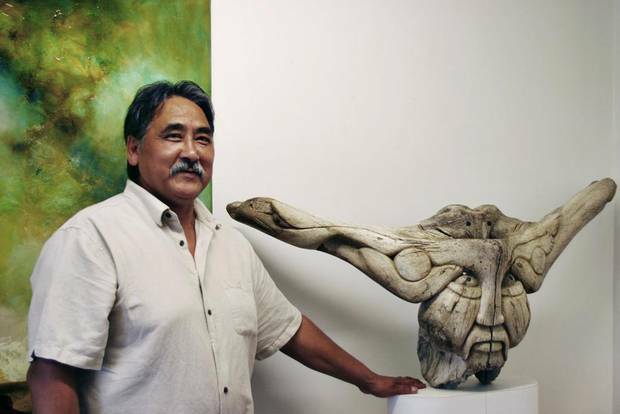 For decades, Inuit sculptor Abraham Anghik Ruben has been committed to sharing stories inspired by his parents, his heritage and history through contemporary art. A major focus of his work has been the story of the contact between the Viking Norse and the Inuit. It's a piece of history, he says, that is "vital to our broader understanding of what took place in this country that we call Canada." Mr. Ruben hopes his work can reveal stories that aren't getting told. Through his own art, he wants to elevate the work done by native artists across Canada, so it can be recognized as important and contemporary by other artists in the country and internationally. Currently juggling several projects in Canada, in talks for international exhibitions, with two large, Nordic-themed sculptures in the works, Mr. Ruben is hoping to establish a fund in support of children in the Arctic. After leading Team Canada to multiple Olympic gold medals, and as the first female hockey player inducted into the Canadian Sports Hall of Fame, Cassie Campbell, 43, continues to inspire a generation of young female athletes. Co-founder of the Scotiabank Girls HockeyFest training camp, she is a recent recipient of the Canadian Women's Hockey League Humanitarian of the Year Award. Despite retiring from the game, Ms. Campbell remains a fixture of Canadian sports. In 2006, she became the first female colour commentator for the CBC's Hockey Night in Canada and now works as a sideline reporter for both Sportsnet and Hockey Night in Canada. The rules of hockey haven't changed much over the years, but for Ms. Campbell, the game itself has. "I didn't even know girls played hockey, other than myself and a couple of teammates that were sprinkled into the boys' game," says Ms. Campbell. "Now the girls have role models to look up to. Corporations are starting to include the female game. Little boys know who the women's national team players are." It's hard to overstate the importance of the discovery that infection with human papillomavirus can lead to cervical cancer. Australian experts even said last month they are close to eradicating the disease, thanks to the HPV vaccine and better screening. Eduardo Franco, director of the division of cancer epidemiology at McGill University, has been there since the beginning as one of the key figures to show that persistent HPV infections increased the risk of cancer. Now, Dr. Franco is being honoured for his contributions with an appointment as an Officer of the Order of Canada. While the Brazilian-born researcher is perhaps best known for his work examining the transmission of HPV and how it can lead to cancer, Dr. Franco said he is most proud of a "geeky" discovery in the early 1990s, when the link between HPV and cancer was still debated. Dr. Franco discovered the technology researchers were using was flawed, making it appear the virus wasn't linked to cancer. Dr. Franco tried new methods and eventually found a way that showed the relationship without a doubt. The 63-year-old says he is "not done yet" and that a lot of work needs to be done to counter anti-vaccine myths as well as to improve HPV vaccination rates and cervical-cancer screening methods. For her revolutionary contributions to geochemistry, notably in the development of innovative mechanisms for groundwater remediation, and for her discovery of ancient fluids that hold implications for life on other planets. For his efforts in the public and private sectors to promote forest management and regeneration. For her contributions to our understanding of the cognitive benefits of bilingualism and for opening up new avenues of research in her field. For his achievements as a senior business executive and for his dedication to the well-being of his community. Gregory Charles, O.C., Westmount, Que. For his infectious energy, creativity and dedication to ensuring that the performing arts and culture thrive in Canada and abroad. For his contributions as a historian, author and administrator who has expanded our knowledge and understanding of Canada’s rich political heritage. This is a promotion within the order. For his groundbreaking contributions to the prevention of cervical cancer in Canada and around the world. For his significant contributions to the literary arts and critical thinking for more than half a century. For his contributions to the information-technology sector through CGI Group and for his philanthropic contributions. This is a promotion within the order. For his contributions to the Canadian college system as a long-time academic administrator. For his pioneering use of molecular genetics to identify risk factors in a range of conditions, including infectious diseases and cancer, and for his leadership in the health sciences. For his success in transforming the Toronto International Film Festival into a fixture of world and Canadian film. Roberta L. Jamieson, O.C., Ohsweken, Ont. For her contributions to indigenous peoples across Canada, particularly her work to improve funding, access and opportunities for indigenous youth in the area of education. This is a promotion within the order. Nathalie Lambert, O.C., Anjou, Que. For her achievements in Olympic sport and for her tremendous contributions to athletics in Canada as a renowned mentor and spokesperson. For his contributions as a neurosurgeon who helped establish deep-brain stimulation as a globally recognized treatment for movement disorders. For his achievements as a business leader and for his contributions to academic institutions as a philanthropist. For his scholarly contributions to the study of ethnic conflict and for designing governance frameworks that promote peace. For his innovations in deep-sea exploration, which have improved safety and made Canada a leader in underwater development and commerce. For his service to the legal profession and for his commitment to justice as a commissioner of the Walkerton and Arar inquiries. Sophie May Pierre, O.C., O.B.C., Cranbrook, B.C. For her role in the British Columbia treaty process and for her commitment to the economic development of First Nations. Thomas Quinn, O.C., Beaconsfield, Que. For his achievements as an experienced business leader and for his contributions to the vitality of sport in Canada. For contributing to Canadian health care by developing evidence-based policy and for promoting and disseminating medical research with a particular focus on the well-being of children. This is a promotion within the order. Abraham Anghik Ruben, O.C., Salt Spring Island, B.C. For his artistic contributions as a sculptor and for his preservation of our northern heritage and national identity. Tsun-Kong Sham, O.C., London, Ont. For his leadership in establishing the Canadian Light Source research facility and for his seminal scientific contributions using synchrotron radiation. For her contributions as a doctor and administrator who has helped advance women’s health care in Canada and maternal and newborn health globally. For his innovative contributions to grape growing in the Okanagan and for creating world-class and award-winning wines that have enhanced Canada’s international reputation in this industry. For his contributions to the advancement of Canadian labour law and for making the justice system more effective and accessible as a former chief justice of the Ontario Court of Appeal. Ronald J. Wonnacott, O.C., London, Ont. For his contributions to Canadian international trade policy, particularly in relation to Canada’s free-trade agreements. For his contributions to the research, conservation and promotion of Prince Edward Island’s Acadian history, culture and traditions. For his leadership as an entrepreneur and for his commitment to the arts and to social justice, notably through Toronto’s the 519 community centre. For her community engagement and commitment to the advancement of women and public service, notably in educational broadcasting. For his advances in applying personalized medicine to cancer treatment and for his leadership in creating research networks in his field. Geoffrey Battersby, C.M., Revelstoke, B.C. For his contributions as a physician, politician and community leader who has encouraged the development of civic, economic and social initiatives in his region. For her contributions as a champion of health-care ethics in Canada and for creating forums to discuss current medical-ethics issues. For his active support and promotion of youth development programs, particularly through the Duke of Edinburgh’s International Award, and for his philanthropic generosity in the fields of youth services and the arts. For her business acumen as a respected employment creator and for her mentorship of women. Timothy Borlase, C.M., O.N.L., Pointe-du-Chêne, N.B., and Happy Valley-Goose Bay, N.L. For his contributions to arts, music and drama initiatives, particularly for youth, in communities across Labrador and New Brunswick. For his contributions as a philanthropist, notably to fisheries conservation and medical research. For his contributions as a photojournalist and for his dedication to several not-for-profit social initiatives. For his contributions to the growth of television broadcasting in Canada as an executive with CanWest Global Communications and as a leader of industry associations. For their leadership in establishing a unique retail brand and for their commitment to the environment and to healthy living. For her contributions to Canadian women’s hockey as a player, broadcaster and role model. For her contributions to the development of French-language education in Ontario and for her commitment in defending language rights to improve the well-being of her community. For her public service and for her work as a champion of palliative care. For her contributions to the study of social gerontology in Canada, notably for her influential research into caregiving, dementia care and healthy aging. For her contributions as a social entrepreneur who has helped revive the unique rural communities of Fogo Island and Change Islands through innovative social engagement and geotourism. For her leadership in advancing pay equity and for her long-standing commitment to social justice. L. Mark Cullen, C.M., Stouffville, Ont. For his contributions to promoting and developing horticulture education in Canada and for his ability to explain how Canadians can protect the environment. Madeleine Delaney-Leblanc, C.M., Shediac, N.B. For her contributions to the advancement of social justice in New Brunswick, particularly her work on behalf of women’s rights. For her insightful contributions to the study of early works of English literature and for her service to the academic community. For his achievements and dynamic presence on the theatre scene and for his significant mentorship in the arts. Charlotte Diamond, C.M., Richmond, B.C. For her contributions as a children’s entertainer who, through music, helps develop creativity and self-expression in youth. For his innovations in loyalty management, which have propelled his firm to the global forefront, and for his dedication to a variety of causes, including the arts and health care. For his pioneering research, which has contributed to the success of Canada’s canola oil industry. For her contributions to translating research into health-care improvements for older Canadians. Yvon Éthier, C.M., Terrebonne, Que. For his contributions to Quebec’s country music scene as Patrick Norman and for his dedication to numerous charitable causes. For his contributions to the advancement of choral music in Canada as a conductor and educator. For her contributions to advancing our understanding of the behaviour and society of several primate species and for her dedication as a mentor to the next generation of primatologists. For her contributions to health care and health planning as a public servant and hospital administrator. For his leadership in providing evidence-based research to policy-makers and practitioners in the movement to prevent and reduce homelessness in Canada. For his contributions to Canada’s investment industry and for his philanthropic support for higher education, culture and health care. For his contributions to Canada’s musical repertoire as an accomplished jazz saxophonist. For her achievements as an internationally renowned opera singer and cultural ambassador for Canada. For his accomplishments as a business leader and for his sustained commitment to his community, notably in support of poverty reduction and indigenous peoples. For her contributions as a psychologist and therapist who has developed an innovative and empirical approach to marital, couple and family therapy. For her brilliant career as a musician and for her dedication to ensuring copyright protection for artists across Canada. For advancing classical guitar in Canada as a musician, pedagogue, mentor and co-founder of the Guitar Society of Toronto. For her contributions as a musicologist and historian of Canada’s musical heritage. For his entrepreneurial contributions to the growth of Canada’s retail industry and for his philanthropy. Michael Charles Klein, C.M., Roberts Creek, B.C. For his sustained contributions to integrating family medicine and maternity care in Canada. For his contributions as an art historian and for his efforts to promote the artistic heritage of Quebec and Canada. For his contributions as an oncologist, researcher and clinician who has developed a number of new treatment regimens that have become the Canadian standard in clinical practice. For her contributions to making science easier for children to understand through her hands-on workshops and for her work to involve parents, teachers and librarians in science education. For his contributions to public administration and to the administration of justice in Ontario. For her contributions to museum planning and management and for her work in supporting the cultural sector in Canada and abroad. For his contributions as a leading advocate and administrator in the field of mental health care. For his contributions as one of Canada’s most skilled, empathetic and provocative editorial cartoonists. For her efforts as a psychiatrist and pediatrician who seeks to prevent, reduce and respond to family violence. Joe Mancini, C.M., and Stephanie Mancini, C.M., Kitchener, Ont. For their commitment to the homeless and marginalized of the Kitchener-Waterloo region, notably for the creation of the Working Centre. For his leadership in business education and for his innovative studies in corporate management. For his contributions to Canadian culture as an actor, writer and director. For her pioneering achievements in publishing and for her unstinting support of Canadian writers. For her creative contributions as a ballet dancer and choreographer and for her leadership as the artistic director of Ballet BC. For his contributions to the management of cardiovascular disease and to the advancement of patient health management. For his contributions to the conservation of Arctic shorebirds and other migratory species. For his contributions to the people of New Brunswick as a lawyer, judge, lieutenant-governor and indigenous leader. Niels Ole Nielsen, C.M., Spruce Grove, Alta. For his contributions to veterinary medicine in Canada as an academic and administrator. For his contributions to Memorial University as an educator and orator and for his impact as an advocate for the preservation of built heritage in Newfoundland and Labrador. For his leadership in the Atlantic Canada business sector and for his community involvement as a volunteer with a variety of social interest, municipal and local business groups. Eric L. Peterson, C.M., Heriot Bay, B.C. For his philanthropic contributions and for his unreserved commitment to health care and the environment in remote indigenous communities in British Columbia. For his contributions as a labour arbitrator and for his work in improving labour-management relations in several key Canadian industries. For her contributions to the success of academic institutions as an administrator and for her efforts to create educational opportunities for indigenous peoples. For his contributions as a leader in the financial-business sector and as a dedicated volunteer with various charitable organizations. For building an iconic brand that is a model of entrepreneurial success and for his commitment to the preservation of Canada’s North, notably as chair of Polar Bears International. Howard Warren Rundle, C.M., London, Ont. For his commitment to the development and growth of Ontario’s colleges and for his leadership at Fanshawe College. For his accomplishments as a science-fiction writer and mentor and for his contributions as a futurist. For her contributions as an athlete and coach who has fostered the development of women’s basketball in Canada. For her contributions to arts and culture organizations in New Brunswick, particularly for her work with youth in theatre. For her long-standing devotion to social justice, notably her work with the residents of Vancouver’s Downtown Eastside. For her contributions to the hotel and financial-services sectors and for her community engagement, most recently as chair of SickKids Foundation. Richard Tremblay, C.M., C.Q., Saint-Jean-sur-Richelieu, Que. For his service in providing protection and justice within the Quebec community for more than 40 years and for his tremendous contributions as founder and director of the Canadian Organ Donors Association. For his contributions to the financial sector as president of the National Bank of Canada and for his community and philanthropic engagement. For her commitment to Yukon as its 15th commissioner and for her role in the development of the territory’s tourism industry. For his leadership in intellectual-property law as a scholar and mentor. James W. St. G. Walker, C.M., Waterloo, Ont. For his influential scholarship that has shed light on the contributions of black Canadians to the development of our nation. For his contributions to enriching economic-policy debate as an economist and as the founder of the Fraser Institute. For his contributions as a leading public servant, jurist and regulator who has served on the Federal Court and as chair of both the Ontario Energy Board and the Ontario Securities Commission. For her contributions to the development of the Northwest Territories and for her work as a commissioner with the Truth and Reconciliation Commission of Canada. James G. Wright, C.M., Toronto and Oxford, U.K.
For his advances in the field of pediatric orthopedics, notably in identifying the optimal treatment for a number of childhood conditions requiring surgery. For her service within the governments of Saskatchewan and Canada, notably for her immense contributions to maintaining and improving health care for Canadians.